Subscribe Now to Receive Free Ebook! I started my career as a waitress, then an administrative temp, an administrative assistant, and later found myself on a path to being an executive assistant with a process improvement focus/specialty. When I began leveraging the force.com platform as my go-to solution to help solve people’s problems (and turning into a business analyst), I found my way to becoming a full-time salesforce.com administrator! I believe having a quick win mind-set over the years ultimately is what lead me to where I am today. Whether it was going the extra mile to figure out how to ensure my customers had an amazing dining experience (i.e. just having the bill printed in my pocket at all times because I realized how easy it is to just add more to it later if they ordered something else, because when people want to leave nothing is worse than waiting for the bill! ), or gaining support from an executive to communicate the hard truth instead of hinting at or working around it (i.e. “You are no longer allowed to use the legacy system, your deal does not exist if it is not tracked in Salesforce. Period.”), or facilitating an introduction between two people who did not know the other existed; these type of actions have always been key to successful process improvement and change management throughout my career. Quick wins are the connection of people with process and making the expectations clear… “Hey Jane meet Joe, he is the person who must clean up your mess when you throw the contract into the system without filling out all the necessary information or providing the abstract; and after talking with both of you it seems you two don’t even know the other person even exists, but now that you know each other maybe you could help improve and maximize your efforts through collaboration and teamwork? What do you think! ?” Add to this suggestion actual examples of how they both win if they work together and you just became a hero to them! “Quick wins” have a strong focus on results, specifically around “delivering a new and visible contribution to the success of the business”. I like this definition as used by the Harvard Business Review in this article about the paradox of quick wins, because it highlights the importance of measuring the win through the success of the business. I also like this article because it reminds us that a messy and toxic quick win is much different than an effective and successful quick win. The key determining factor in a successful quick win and a failure is your ability to manage the process changes within your team effectively. Therefore, I can’t stress the importance of implementing a salesforce.com quick win in a very specific manner as explained here in the 8 Steps to Managing Successful Salesforce.com Projects documentation (no matter how small or big the project is)! #1) The sales team changes the status of the opportunity record when they email the contract out but there is no way for the VP of sales to see a full report of how long it takes a contract to be signed on average. Implementing an auto field update based on the status changing to “contract issued” to capture the current date and then another date field capturing when the status is changed to “contract is signed” can be done very quickly using out of the box functionality. PRO TIP ALERT: To learn how to implement an Automatic Date Field Update check out episode #1 of the new Admin to Admin Academy Podcast! #2) A subject matter expert (SME) that processes invoices for the team has mentioned in one of your regular review and check-in sessions with her that she sends an email to a different group to let them know when an invoice is over a certain threshold (or meets some other criteria). You tell her you can easily setup a workflow rule to email that team a notification automatically when the criteria is met. PRO TIP ALERT: If you don’t currently have regular check-ins with your power users, setting these up is a quick win on it’s own! Check out this great article from AdminHero.com Brent Downey, and be sure to download the referenced slide deck as it has great examples about how to empower your users to become super users! #4) Implement a series of dashboards for your team! Think about what metrics would be valuable for your team to see on a dashboard and build one for them proactively – they will be super excited (as always be sure to ask for feedback and revise as necessary, the dashboard is for them after all!). PRO TIP ALERT: Search the AppExchange for free dashboard packets to download to get you started – like this one for Leads. #5) Check out FormAssembly. This product is affordable and solves a problem a lot of us admins have… collecting information from people without a license in Salesforce. Whether you want to solicit information from an external party (customer or partner or client) or an internal party that does not have a license (and doesn’t need one because there is no other reason to have them in the system except to provide some information at some point in a process that is owned by the sales team for example), you can send them a link to fill out the data and then it is populated into Salesforce as if they updated/created the record. AND VALIDATION RULES APPLY!! It is amazing!! #6) Create a private Chatter Group and add your super users to the group. Share information with them and keep an open dialog. Remember, they are your super power… if you make any quick wins for them you win big time (and so does everyone else!). Knowing what is on their mind and being their go-to person will help your career and the entire company in being extremely productive and efficient. Your super users are the life-source of all processes (and they are a true force in driving user adoption and change management). PRO TIP ALERT: See PRO TIP under step #2 and download the referenced powerpoint for more details on this! 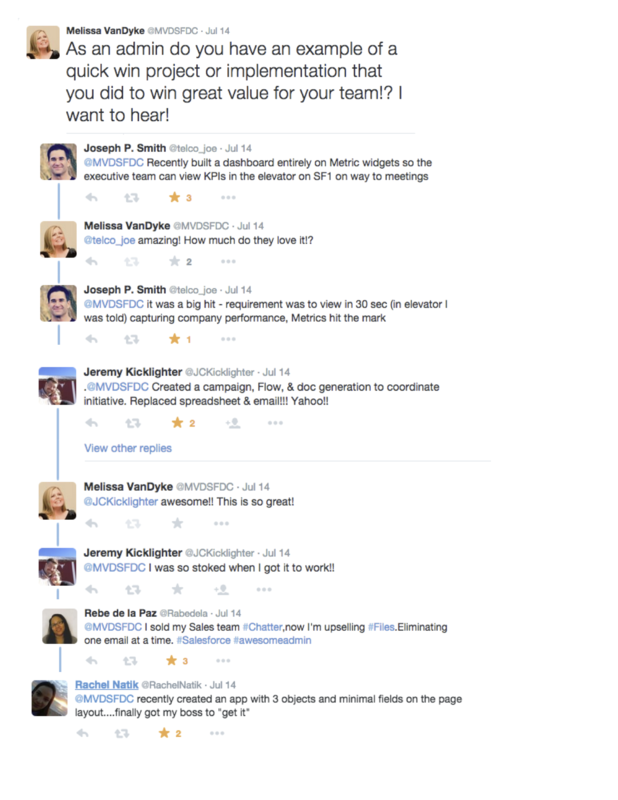 #7) Follow the lead of these amazing #AwesomeAdmins who have shared their quick win stories with me on Twitter. You can post your story on Twitter now using #SFDCQuickWins hashtag. Let’s start sharing our quick wins and inspiring other #AwesomeAdmins today!! Thank you to these #AwesomeAdmins for participating in the #SFDCQuickWins original survey! Keep up the great work and inspiring other admins in the community!